On our second day in Rome, we had reservations for the Vatican Museum. I highly recommend reserving these in advance online, by the way; the lines were very long first thing in the morning and it was SO nice to skip them. We chose to explore on our own rather than paying for a tour guide or an audioguide. Truth be told, we didn't have a lot of interest in poring over all the exhibits in the museum; we mostly just wanted to see the Sistine Chapel. The hall of tapestries along the way was incredible. I don't have good pictures, but the level of detail and artistry created with *thread* was mind-boggling. They looked like paintings, not woven fabric. Once we made it through the quarter-mile-long gallery of sculptures, tapestries and maps, we used the Rick Steves Audio Europe app to orient us in the Sistine Chapel. It was at this point that I got fed up with Rick Steves. I had enjoyed listening to his podcasts before our trip, but the audio tours, not so much. It's like he tries too hard to be funny, in that way that only induces eye-rolling. But my irritation in the Sistine Chapel was beyond that; as a Christian observing these biblical scenes, I felt that some of the things he said seemed blasphemous. So while it was necessary to have *someone* telling us where to look and what we were seeing (the chapel is so overwhelming otherwise), I wouldn't recommend his audio tour. That said, we did learn a lot. The overview was about half an hour--and let me tell you, it is painful to spend 30 minutes trying to look at a tall ceiling! I cannot wrap my mind around how such artwork was executed, or how it has endured through so many centuries, or how it could be cleaned and restored without damaging it (one corner has been left dirty, so you can see the contrast between the gray film of soot that once covered the paintings and how beautifully they have been uncovered). Michelangelo's vision and skill are astounding, and Rick Steves provided lots of interesting background about the artist and his process. The scenes are alternately moving, worshipful, confusing and troubling. I was particularly surprised by the famous Creation of Adam in the center. Somehow, I had only ever seen a cropped version of the painting, with the disembodied finger of God reaching out to touch Adam. I had seen all of Adam, but I don't think I'd seen the rest. The entire painting in context actually bothered me. I know that some Christians believe God should never be portrayed in art, to the point that children's storybook Bibles are in violation of the second commandment. 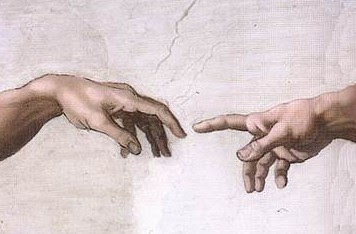 I don't hold this conviction, but as I studied the ceiling of the Sistine Chapel, I realized that there is a profound difference in my mind between painting Jesus Christ, who actually existed in a human body and was seen by men, and painting God the Father, who Scripture says is "invisible" and is "Spirit." I find artistic portrayals of Jesus to be powerful and beautiful, but the portrayal of God the Father creating Adam felt inappropriate and wrong. After our strained necks couldn't take any more, we followed a fantastic tip from Rick Steves and sneaked out through the back entrance of the chapel. It's marked "exit for private tour groups only," but it was simple to follow one of the huge groups out the door. This shortcut brought us out right next to the entrance to the dome of St. Peter's Basilica, saving us a long walk and a wait in a security line. It also set us up for a perfect first look at the basilica. We paid seven euros each to climb the 551 steps to the very top (it's only five euros if you want to take the elevator partway). The first leg of the climb takes you to the roof, with up close views of the dome. I absolutely recommend that you explore in this order! It was spectacular to enter the basilica for the first time at this level (and it's much quieter up there!). After seeing the inside of the dome, we continued climbing to the very top. It's an increasingly narrow stairway between the inner and outer domes; as you get close to the top, the ceiling curves over your head and it's a tight squeeze. In other words, not only do you want to skip this if you're not in good shape or if you're afraid of heights--it's also not for the claustrophobic. In the photo below, Steve is *not* leaning against the wall; he's standing up straight! And after going back down all those stairs, you're ready to explore the basilica at ground level. It took 120 years from the time of groundbreaking until St. Peter's Basilica was completed. The scale and the grandeur, of course, cannot be captured in my pathetic photos. Do you see all the Latin words in blue on a gold background? These are Jesus' words to Peter from the gospels, running all around the church. They may look small--but they are nearly seven feet tall! This site has held a Christian church ever since the time of Constantine. Tradition (and strong historical evidence) says that the apostle Peter's tomb is directly below the high altar (in bronze, sculpted by Bernini). Michelangelo's Pieta is here as well (behind bulletproof glass). I appreciated being able to see this sculpture in person with the benefit of some background information: a friend had told me that if Mary seems out of proportion in relation to the size of Jesus, contemplate the fact that Michelangelo's mother died when he was just seven years old. A mother is awfully big from a little boy's perspective. Rick Steves' Pocket Rome also makes thoughtful points about the piece (I appreciated the book's ability to give non-artists like me a tiny taste of understanding about the significance of various paintings and sculptures). Once we had made our way around the basilica, we exited the front and got to see the familiar, imposing St. Peter's Square. St. Peter's Basilica--especially the dome climb--was one of the highlights of the trip for me. I would consider it a must-see for visits to Rome! Love Michelangelo! What a character! I strongly recommend Mike Venezia's picture books of artists, musicians, scientists, etc. Your boys might love them, mine do. Our library has a ton of them. So amazing. I'm loving your series and sharing all your pictures! Buon Viaggio: 31 Days of Italy!